This article is part of the Gospel-Centered Partnerships series. As a not-for-profit Christian ministry, Crossway works in partnership with other like-minded ministries around the world to see the gospel of Jesus Christ go forth and to equip the global church with ESV Bibles and other Bible-based resources. Over thirty years ago, former missionary and executive director of Bible Study Fellowship International Rosemary Jensen founded the Rafiki Foundation to bring the Word of God and quality Christian education to orphans throughout Africa. Through a recent partnership with Crossway, the Rafiki Foundation is now working to equip thousands of Christian leaders in Africa with study and ministry resources. We talked with Rafiki’s executive director, Karen Elliot, about the work that Rafiki is doing and their hopes for how the Lord will continue to work through their efforts across Africa. What does rafiki mean and how does that word speak to the heart of your vision for the Rafiki Foundation? Rafiki is a Swahili word that means friend. Rafiki exists to befriend Africans by providing daily Bible study materials and Christian classical education to thousands of children and youth in ten African countries. The Rafiki Foundation has two main goals: to help Africans know God and to help them raise their standard of living with excellence and integrity. How and when did the Rafiki Foundation begin? The Rafiki Foundation was founded in 1985 by Rosemary Jensen and others. It was started so that the study of the Bible could be provided to Africans and to help them in various other ways through education and medical work. Rosemary and her husband, Dr. Bob Jensen, had been missionaries in Tanzania in the 1960s. After returning to the US, Rosemary became the general director of Bible Study Fellowship (BSF) International. She has always loved God’s Word. Since the age of 16, she has read the Bible every day of her life! With her love for God’s Word and the African people, it was only natural—and as she would say, the “right thing to do”—to bring the BSF Bible study materials to Africa through missionaries sent by the Rafiki Foundation. And so Rosemary and three others founded Rafiki in 1985 to do just that. Over time, the work developed and when Rosemary retired from BSF in the year 2000, Rafiki then began to develop its own Bible study materials and also build orphanages and schools in ten countries in Africa. In what countries do you have a presence and what are the various branches of the ministry? Rafiki has Rafiki Villages in ten African countries: Ethiopia, Ghana, Kenya, Liberia, Malawi, Nigeria, Rwanda, Tanzania, Uganda, and Zambia. In each Rafiki Village, Rafiki has a children’s home for orphans, and preschool through grade 12 Christian classical school for the orphans who live there and impoverished children from the surrounding community. In eight of our ten countries, we have a Christian classical teacher’s college called the Rafiki Institute of Classical Education. Additionally, during Rosemary’s sixty years of ministry in Africa, she has established relationships with twenty-three African denominations that partner with the Rafiki Foundation. We have a widows program that benefits the widows and poor women of those denominations by marketing their handcrafts in the US. We also provide our Rafiki Bible study to them. In addition to the orphanages, schools, and teacher’s colleges, The Rafiki Foundation has created (by God’s grace) it’s own Bible study and Christian classical curriculum for use primarily in Africa. The Bible study was written by eighteen theologians and covers all sixty-six books of the Bible in 553 week-long lessons. These lessons have also been made age-appropriate so that we have material on each book of the Bible for preschool, lower and upper primary school, junior high, and senior high school students. In addition, Rafiki has its own Christian classical curriculum which consists of 60,000 pages of texts and student materials from preschool to grade 12. These materials are being made available for free to our twenty-three partner denominations with the goal to transform 1,000 African church schools with Rafiki’s Christian Education System in the next decade. Through our partnership with the Rosemary Jensen Bible Foundation and Crossway, Rafiki will provide a children’s Bible to every child who can read in those church schools—hopefully impacting 500,000 children over the next ten years or more! Why did Rafiki decide to adopt the ESV as its primary English Bible translation throughout Africa? We have been using the ESV for the past ten years primarily because it is a sound translation and user-friendly for an international audience. More recently, how have you partnered with Crossway? What specific resources are especially exciting to you? Rosemary Jensen (president and founder of Rafiki), who is also the president and founder of the Rosemary Jensen Bible Foundation, had purchased the ESV Holy Bible for Kids, the ESV Following Jesus Bible, and the ESV Student Study Bible from Crossway to send to the children of the Rafiki Foundation Villages and schools. Then, in 2017–2018, she was looking for a Bible to send to pastors of the twenty-three partner denominations in Africa that work with Rafiki. Pastors in Africa have limited access to study Bibles and, if they are available, they are not affordable—it typically costs a pastor at least one month’s salary to buy a single study Bible! And yet, these pastors are in desperate need of sound theological material. Rosemary found the ESV Systematic Theology Bible from Crossway and knew that with the ESV translation and over 300 doctrinal sidebars, it would be an excellent resource for pastors in Africa. 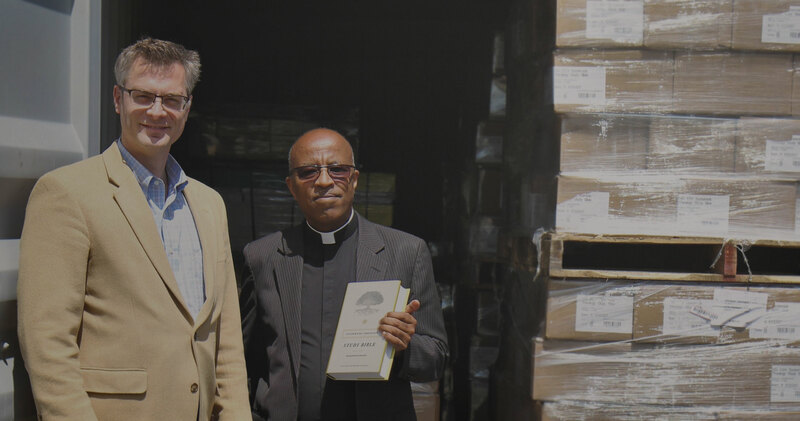 So by God’s grace, the Rosemary Jensen Bible Foundation purchased 20,000 copies of the ESV Systematic Theology Study Bible and they have been shipped by Rafiki and distributed to pastors through twenty-three African partner denominations in ten African countries in the last eighteen months. The next exciting project is distributing copies of the ESV Holy Bible for Kids, the ESV Following Jesus Bible, and the ESV Student Study Bibles to over 1,000 church partner schools that adopt Rafiki’s Christian Education System over the next ten years, thereby impacting 500,000 children and 15,000 teachers in those schools. In what ways can people get involved with Rafiki (either in Africa or from afar)? We would hope that God would call out at least twenty more missionaries in the next year to go out and serve as teachers, headmasters, deans of our teacher’s colleges, managers of our orphanages, music and art teachers, administrators of our Villages and widows programs, and lastly, as plant managers. We can use people from all walks of life! Those not called to overseas missionary service can participate in the work by donating funds to Rafiki to provide scholarships to day-students to our school, to sponsor an orphan, to fund construction of buildings, to outfit a classroom, to fund the general operations of a Rafiki Village or the Headquarters, or to support a missionary. Lastly, those who are eager to support the ministry can buy products made by widows and poor women of the church in Africa (Mother’s Day is just around the corner! ), which are available through our store. What’s one thing you’ve seen the Lord do recently at the Rafiki Foundation that really encourages you in your work? God has brought us great friends at Crossway! Seeing 20,000 ESV Systematic Theology Study Bibles go out to pastors is such a joy! In addition, we have begun to see our Rafiki Christian Education System flow out to other schools which is bringing the study of God’s Word and great education to so many more needy children. For more information about The Rafiki Foundation or the Rosemary Jensen Bible Foundation, please visit rafikifoundation.org or email RJBF@gmail.com. To learn more about how you can support Crossway’s ministry and our gospel partnerships around the world, visit crossway.org/donate. Crossway is a not-for-profit 501(c)(3) ministry. Everything that Crossway does is for ministry purposes and is carried out under the oversight of the Crossway Board of Directors. The mission of Crossway’s Bible ministry is the share the gospel and the Word of God through the publication and distribution of the Bible and Bible-based materials. No part of any donation is used for administrative purposes, since all administrative services are provided without cost by Crossway. All revenue generated from Crossway sales, services, and ministries are used solely for the purpose of furthering the Crossway mission. All donations are tax-deductible.